Before you go out on the water, always check the weather using a marine weather forecast. Land and general forecasts do not take into account wind speed over water, which is double that over land. It is vitally important to be aware of the current weather conditions in the area you plan to boat in, and also how conditions will develop over the course of your trip – and a bit longer, just in case. This page has details of how to access and understand the weather forecasts and warnings published by the Bureau of Meteorology (BOM) via various media. 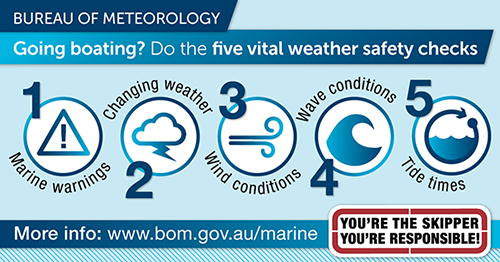 Visit BOM's Marine weather and ocean service for the latest weather charts, satellite and radar images as well as warnings and forecasts for the next four days. This site also provides links to tidal information, sunset and sunrise times as well as full schedules for all radio and phone services. MetEye shows the official forecasts produced by BOM in an interactive map. 6x6 km gridded forecasts are available for wind, waves, weather and much more in three hourly increments, for up to seven days ahead. For boaters in areas of marginal mobile phone coverage,or whose offshore access is limited to satellite internet communication channels, the Marine Lite weather service provides text-only Marine forecasts and warnings. 27MHz There are weather services provided on 27MHz by some limited coast stations. Broadcasts an initial weather warning on VHF Channel 67 as soon as possible after receipt. Broadcasts current weather warnings at 00:48, 02:48, 04:48, 06:48, 08:48, 10:48, 12:48, 14:48, 16:48, 18:48, 20:48, 22:48 EST on VHF channel 67 following initial broadcast until notice of cancellation is received by fax from the BOM. Broadcasts notices of cancellation of weather warning as soon as possible after its receipt and at the next scheduled Victorian coastal weather forecast broadcast. NB: Broadcasts of, and cancellation broadcasts of, weather warnings will be preceded by a SECURITE announcement on VHF channel 16. 0130, 0530, 0930, 1330, 1730 and 2130 EST (add one hour for EDST). Warnings are broadcast every hour starting 0000 EST. For the latest marine forecasts on Port Phillip and Western Port, dial 1900 926 110 for the cost of 77c per minute. For Victorian Coastal Waters forecasts, dial 1900 969 930. For the latest warnings, dial 1300 659 217 for the cost of a local call.